This two-part Mandalorian arc (composed of eps 3.05, “Corruption,” and 3.06, “The Academy, and, yes, I’ve had to jump ahead a bit in order to watch chronologically) is quite an interesting departure for Clone Wars in that it doesn’t directly concern the Republic as a whole–although it is certainly representative of it–and features only very limited Jedi action. In fact, the first episode is one of the very few episodes of the series that contains not a single Jedi. The episodes concern Satine’s attempts to root out corruption on Mandalore, at first with the help of her friend, Padme Amidala and later with Ahsoka, and while they do discover a conspiracy, it is significantly not the work of Death Watch or of Separatists trying to undermine their planet but simply petty, mundane corruption: politicians behaving greedily, consolidating money and power for themselves while their people starve. As Padme confirms, the Republic has gotten so huge and unwieldy that this sort of evil has been able to take root and flourish, with very little to no oversight. It’s important to note, however, that while this corruption is distinctly different from the world-dominating evil of the Sith, it is due to the weaknesses and instabilities that it causes that Palpatine was able to take advantage of the situation in the first place. In the first episode, Satine and Amidala learn that many children have grown deathly ill, and they narrow down the cause to a poisonous ingredient in the soft drinks served at their schools. As it turns out, the makers of the drink hadn’t intended to harm the children but had simply used an ingredient that diluted the tea, allowing them to produce more of the beverage, more cheaply, and to then, of course, sell more, and they had no idea that it would cause such a negative reaction. I never expected to find an aspartame metaphor in a Star Wars story (although aspartame is even more insidious, as the soda companies are fully aware of its carcinogenic effects), but it points to one of the fundamental aspects of science-fiction, in being able to comment on current concerns through a futuristic or fantastical lens. It also makes this particular story and arc stand out as feeling more contemporary and less mythic than most of the rest of Star Wars and yet, for me, it works. I like that this show is able to delve into so many different aspects of this universe, including ones that are more mundane, because it shows how not all evil is world-shaking and epic. Again, for the grandly mythological evil to spread, it has to begin by feeding on the petty evil of greed and corruption. Padme with Satine and her guards. I also really like that, after paralleling Padme and Satine in previous episodes, this one allows them time to spend together, and that they hit it off just as well as one would expect, both extremely passionate about their beliefs and also in sync in many ways. 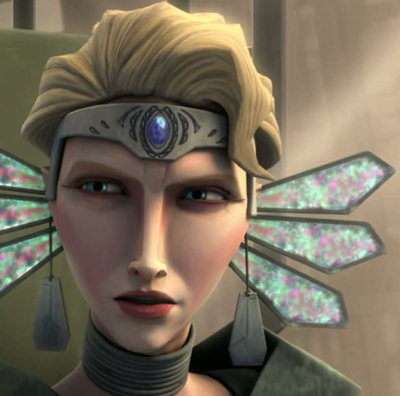 For example, although more actively involved in the war due to her planet’s involvement, Padme has just as many misgivings about it as Satine does. They also balance each other beautifully. In one particularly powerful moment, the normally pacifistic Satine is nearly driven to an act of violence against one of the men harming the children, and Padme steps in to remind Satine of herself. It’s also nice to see a Padme episode in which Anakin isn’t involved at all. Although we have seen her stand on her own two feet before on the show, she still most often interacts with her husband at some point, and here, her appearance is just about her, her political career and philosophy, and her friendship with this other ruling woman. 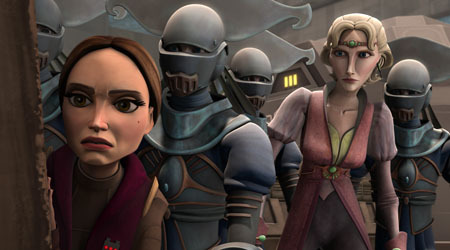 Yet again, the Bechdel Test is passed on Clone Wars with flying colors. After helping to save some children in the first episode, the second episode is about a small group of young people who–with the help of Ahsoka–take responsibility to root out corruption themselves. This is a particularly powerful message for children and one which you don’t often see in American stories–this idea that not only do children have the ability to be just as strong as adults but that, even more importantly, adults and their rules are not always right. There are times when rebelling isn’t only justified but the right thing to do. Roald Dahl made this argument most strongly in Matilda, whose small heroine learns the lesson that sometimes being “naughty” is the only way to stand up against corruption. I find it interesting that the children in this episode also have English accents, because it speaks to this sort of moral relativism, which appears far more often in European children’s stories than American ones, which often seem more likely to preach about following rules than about assessing for oneself whether those rules are themselves morally right. The episode also follows in the Star Wars tradition/theme of showing seemingly small, insignificant characters proving themselves just as worthy and strong, if not more so, than the grandest villain. At the same time, it provides the nifty flip of having Ahsoka, another to-the-naked-eye seemingly small, young, and inexperienced girl, take on the role of teacher to these kids, pointing not only to what she’s learned over the course of her apprenticeship thus far but to the idea that she still remains very much like these kids, at heart. The final scene, in which Anakin praises her for what she’s accomplished, as well as commenting on how risky it was to involve untrained children on her mission is a nice moment for them while also carrying darker shades of ironic foreshadowing, as does any time Anakin comes in contact with children.